Great Z's: I Learned To Distill Alcohol From Purell. Best Fire Safety Class Ever. I Learned To Distill Alcohol From Purell. Best Fire Safety Class Ever. Every few years, our hospital requires that all employees take a class in fire safety. It's usually pretty boring. We learn about the different fire extinguishers in use, how to set off the fire alarm, and map out where all the fire escapes are around the facility. Useful to know, but not a lot of fun on a weekend morning. This year, the instructor demonstrated something more entertaining. 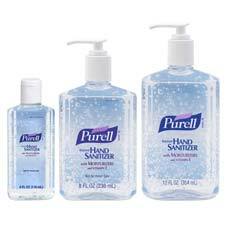 We got into a discussion on the ubiquitous presence of hand sanitizers throughout the hospital. There used to be some trepidation about placing bottles of sanitizers in hospitals because they contain 63% alcohol, an apparent fire hazard located by the door of every patient room. To illustrate the flammability of the Purell, he poured some of the gel into a shot glass and lit it with a cigarette lighter. Sure enough, the gel burned with a faint bluish alcohol-fed fire. Luckily there has been no increase in the incidence of burns in hospitals since Purell dispensers were installed. Since our society simply abhors any form of bacterial contamination, hand sanitizers were quickly mandated in most places where large groups of people congregate and live, like prisons and nursing homes. Much to the administrators' dismay, people were soon abusing the Purell as an alcohol substitute. How did they do it? The moonshiners can't just build a still in their bedrooms and start making alcohol. It has to been done with mundane household items that were easily accessible. They discovered that nothing was more mundane and common than the salt shaker present at every table in the cafeteria. Our fire safety instructor then showed us how prisoners and old folks were able to easily transform hand sanitizers into a party drink. He first poured some gel into a glass. Then he tapped some salt out of a salt shaker into it. With a few swirls of a swizzle stick, the gel began to liquify. He then poured the liquid into another common household object, a coffee filter. The distillate from the filter was drinkable alcohol. We didn't taste it--it didn't look too appetizing. However if you're thirsty enough, you could mix it with some juice or margarita mix and have yourself a grand old party at the nursing home with this 120 proof concoction. So we learned about Class A, B, C fires, how to single-handedly carry a patient out of a fire, and make alcohol from hand sanitizers. Yeah, that was the best fire safety class ever.